I don't know why it didn't occur to me earlier to start featuring weddings here. I mean, this did start out as a wedding blog, right? And c'mon, who doesn't like seeing beautiful people, dressed in beautiful clothing, celebrating the happiest day of their lives with more beautiful people? That's what I thought. Besides, now I can get more ideas for our shindig. When I made the announcement on Facebook that I was looking for submissions, I was amazed by how many of you readers contacted me to have your special day displayed on Danfredo Rivera. I was also amazed by how many of my personal friends have decided to run off and get hitched recently. 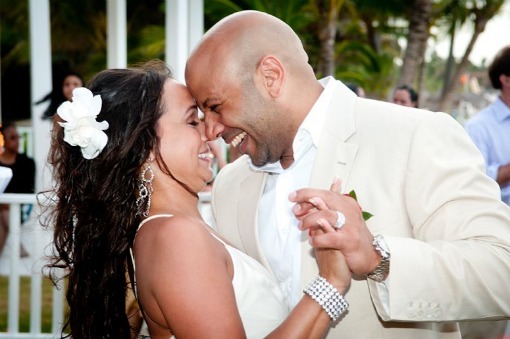 It makes me so happy that this first real wedding post is of my good friends', Roy and Gladys, Paradisus wedding. Enjoy this beautiful wedding, folks! 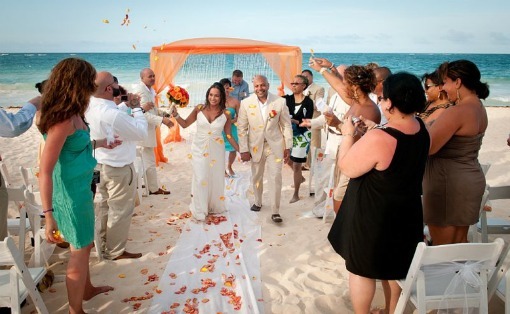 "When we visited Paradisus Punta Cana in June 2001, we fell in love with the eco-friendly resort. During our stay, we witnessed a wedding take place. That's when we decided when we were ready to marry, we would go back. And we did...exactly ten years later!" 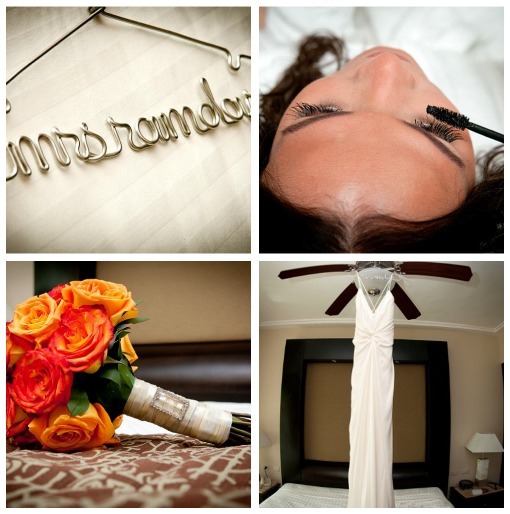 "My overall vision of our wedding was simply modern and classy. I knew I wanted it to pop with colors. Our engagement party was Tiffany box-themed. 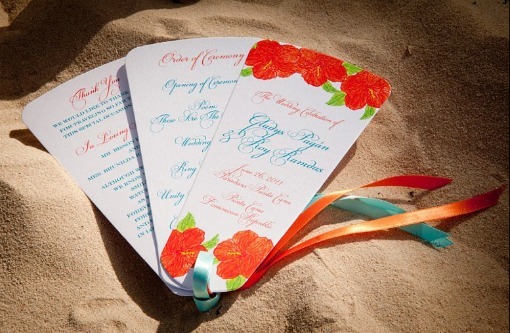 I wanted to carry over the aqua/turquoise color to the wedding and add coral orange (coincidentally, those colors are the colors this season). 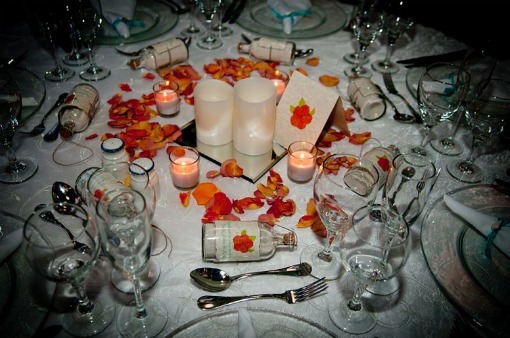 I definitely wanted something different that screamed "modern bride," so I worked with a friend on a custom, one of a kind motif: a hand-drawn hibiscus coral orange tropical flower which was incorporated throughout the wedding." "I wasn’t like your average bride who went around shopping with her maids and mom to find the 'perfect dress.' I actually found my dress online at a boutique sale. I wasn't even engaged yet, so clearly shopping for a dress was not my intention. Being that I knew a destination wedding was set for my future, I knew that beautiful, yet simple, Nicole Miller silk ivory dress would be perfect for my beach wedding. I had it for about two years before getting fitted for it!" "About 90% of our wedding was DIY. With the help of vendors on Etsy and great friends, I totally customized the whole, entire wedding. No lie! I knew exactly what I wanted and how I wanted it. I only rented linens from the resort, which I used for the ceremony setup, cocktail hour and the reception. Thankfully, we traveled first class which allowed us to check in three suitcases EACH, plus our carry-ons, dress and suit. Our friends and family helped us bring a few additional items." 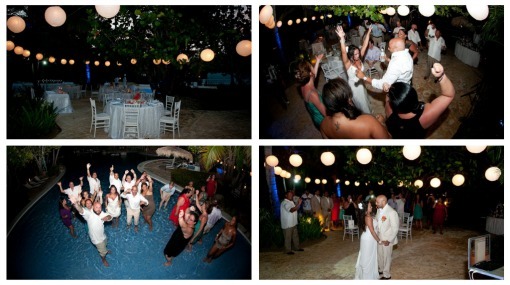 "Being that the reception was held outdoors at the main pool of the resort, I wanted phenomenal lighting. We had white, rounded lanterns and aqua blue LED lighting reflect off the palm trees and votive candles surrounded each lit centerpiece on all the tables." 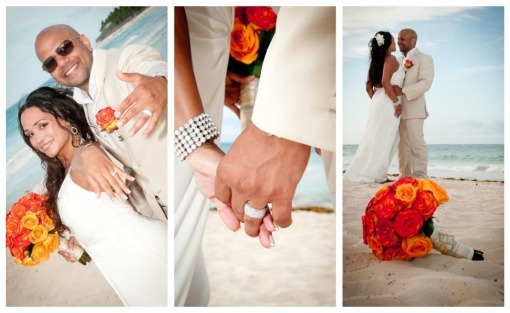 "It was very easy working with our photographer and videographer. They loved how natural our photos were. They didn't have to give us much direction either; it all came naturally. 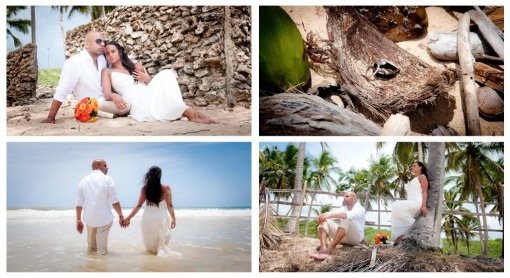 My favorite part of the session was the trash the dress shoot...so much fun!" "It’s hard to name something my favorite part, as it was all amazing. From the moment I walked down the aisle and saw the tears run down my husband’s face-him telling me how beautiful I looked-to him expressing his appreciation of all the work I put into for OUR special day-it was all perfect. He did tell me at the beginning of the planning process, 'The only thing I have to do is show up to the wedding. The rest I leave on you.' I'm glad he was happy as was I...to finally have him as my husband." I literally cried when I saw all these shots Caribbean Emotions had taken of my friends. This whole wedding just blew me away! I wasn't there, but the pictures gave me a front row seat for the entire wedding weekend. If you want to see more pictures of this incredible wedding, click here. Oh, and here's a complete vendor list, too. I had so much fun putting this together for you guys. I know a bunch of you just got hitched...send me your pictures so I can show off your nuptials. I really don't mind, honest. What a beautiul wedding. 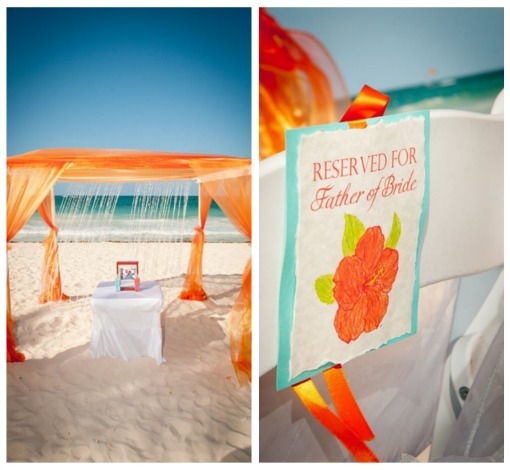 I love the colors for this beach wedding. Just Beautiful.. Congrats to the happy couple. Thank you Danielle for featuring us. It is an honor being the first real wedding posted on danfredorivera.com. Thank you for all your wonderful comments and feedback. It's a pleasure sharing our special day and story with you all!